A feed blower is only a tool to simplify hand feeding. 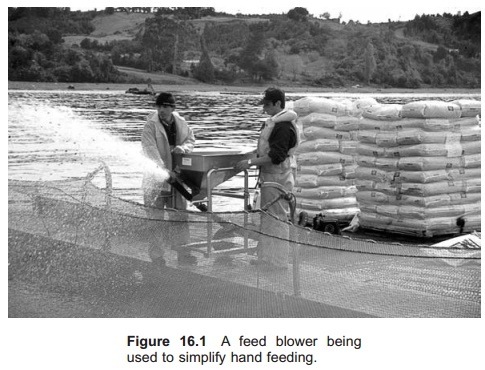 A feed blower is only a tool to simplify hand feeding (Fig. 16.1). There are different blower types based on the ‘carrier’ used for the feed particles which is normally either air or water. The feed can either be sucked up from a tank or a bag by vacuum, or the feed can be filled into a hopper standing over a pipe with flow of air or water. The hopper can be fixed on a boat or be movable. Why use automatic feeding systems in Aquaculture ? What can be automated?